The nerve agent used to poison former spy Sergei Skripal and his daughter Yulia was delivered "in a liquid form", the Department for Environment says. Only "a very small amount" was used on the pair, who were found unconscious on a bench in Salisbury on 4 March. A massive clean-up operation is beginning to decontaminate nine sites in the city - it will take several months and cost millions of pounds. The UK says Russia was behind the attack, but Moscow denies involvement. Yulia, 33, left hospital earlier this month. Her 66-year-old father is said to be recovering more slowly but is expected to eventually be discharged. What happened to Sergei and Yulia Skripal? 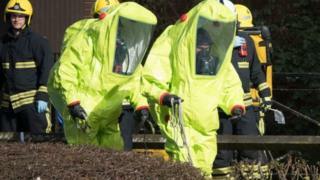 The Department for Environment, Food and Rural Affairs (Defra) said the highest concentration of military grade Novichok nerve agent was found at Mr Skripal's house, but eight other sites are known, or thought, to be contaminated. They include ambulance stations and a police car compound, as well as a Zizzi restaurant and the Mill pub, where the Skripals spent time on the day they fell ill. The nerve agent does not evaporate or disappear over time, experts said, and intense cleaning with caustic chemicals is required to get rid of it. Hoardings will go up in public places in the next few days for the clean-up to begin. Grass and stones will be removed from public areas around the Maltings shopping centre, and all material found to be contaminated will be incinerated. Almost 200 military personnel will help with the work, which is expected to take a number of months. A 10th site - a section of London Road cemetery - has now been reopened to the public after tests established it was not contaminated. The cemetery contains the remains of Mr Skripal's wife and son. Defra's chi ef scientific adviser Ian Boyd said the "number one priority is making these sites safe for the public, so they can be returned to use for the people of Salisbury". The BBC's Duncan Kennedy, in Salisbury, said authorities are stressing that the risk to the public remains very low. The Skripals' poisoning has triggered a diplomatic crisis between Russia and the West, with more than 20 countries expelling Russian envoys in solidarity with the UK. The international watchdog, the Organisation for the Prohibition of Chemical Weapons, has backed the UK's findings regarding the substance responsible. The UK has called for a UN Security Council meeting on the OPCW report, which could be held this week. Moscow has attempted to gain access to Yulia Skripal, but she has so far rejected offers of assistance from the Russian embassy. The name Novichok means "newcomer" in Russian, and app lies to a group of nerve agents developed by the Soviet Union in the 1970s and 1980s. Novichok's existence was revealed by chemist Dr Vil Mirzayanov in the 1990s, via Russian media. He says the nerve agents were designed to escape detection by international inspectors. Novichok agents are liquids, although others are thought to exist in solid form and could be dispersed as an ultra-fine powder. Some of the agents are also said to be "binary weapons", meaning the nerve agent is typically stored as two less toxic chemical ingredients that are easier to handle. When these are mixed, they react to produce the active toxic agent which can cause convulsions, shortness of breath, profuse sweating and nausea.